The past few months have seen me and mine engaged in a long-distance viewing of Marco Polo on Netflix as a group. It’s an immensely beautiful show with some seriously good plot points and just amazing acting, scenery/set design and costuming (oh, the costuming!). 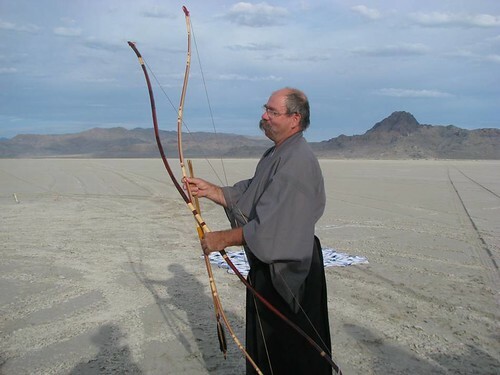 So when my live in sweetie suggested going to a Mongolian Archery workshop as a Valentine’s Day present, I of course jumped at the chance. I’d done archery of the strictly recurve, European kind as a kid, but this was to be something completely different. I love workshops like this and this one in particular fit my rhythms very well: Up at 8, breakfast at the hotel, on The Farm for meditation, then shooting, then tea time, then more shooting, then lunch, then lecture, then shooting, tea time, shooting and dinner followed by another lecture, then retreating back to Jaap‘s (of Yumi Bows) beautiful house for beer and talking about archery, Chinese history, philosophy, tulip cultivation and just about everything else. I was sad to leave but I am filled with an idea for an act, sprung fully formed into my mind while I was helping pull arrows out of the 26m targets, that will hopefully incorporate and share the beauty and skill I found this weekend in the middle of a pinewood forest, listening to the soft twang of a bowstring and feeling the joy as an arrow flew truly to its target. Once again to the frozen North! This time, at least, it did produce my much missed snow. After a highly entertaining Thursday spent watching a live art performance (they turned a girl into a candelabra while wearing white clothes and being handed bowls of liquid wax by a man dressed as a fish monster a la The Creature From the Black Lagoon) and a drag show, then Friday down to my new favorite place, Richmond, VA, to vend my Foxy Fancies at a show by Blacklist Burlesque (and getting to pal around with the brilliantly talented ladies and gentleman that graced the stage there) and finally Sunday included a lovely visit with Tiger of Tiger Torre Art as she vended at Dark Odyssey’s Winter Fire in uptown DC. It was nice to snuggle down in my cozy Northern Home for a week, but with the schedules for the next month being so insane and then the Epicness of April, I likely won’t be able to wander back that way until May.